FROM THE AUSTRALIAN OPEN, Day 2 — Four years ago, Madison Keys, who advanced to the second round, reached the semis at the Australian Open, stunning Venus Williams then she finally went down to Serena Williams. The same thing occurred in the 2017 US Open final when she was incredibly nervous and she lost quickly to Sloane Stephens. Last year, almost out of nowhere, at Roland Garros, she never loves clay, but finally, she understood her strategy, so she reached the semis. 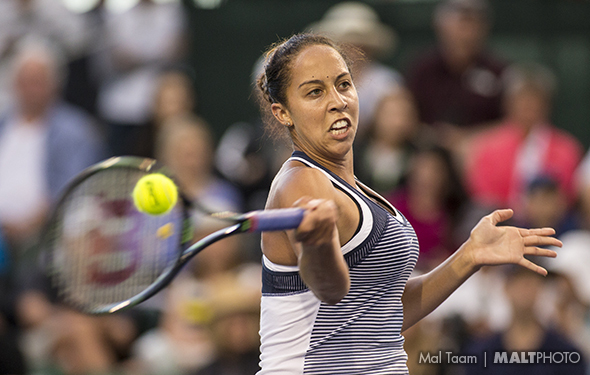 But Keys again lost to Stephens in straight sets. At the 2018 US Open, she was at the semis, playing well, smoking the ball, but she couldn’t not return very well and Naomi Osaka waxed her. All in all, in the Slams, Keys has played very well overall, staying on top of the ball and digging in. She hasn’t won a Slam yet. But, if she can stay healthy all year, she will have a real chance to win it. Her first serve and forehand are gigantic. But will she be healthy during the entire year? She wants to, but that doesn’t mean that it will happen, year after year. However, in December, she decided not to play early in Australia; she didn’t play Brisbane or Sydney. She wanted to wait and feel healthy. On Tuesday, Keys beat Destanee Aiava, easily. In 2018, at the AO, the 23-year-old Keys reached the quarters, going down to the former champion Angie Kerber. That was another tough loss, because the German is very quick, and can run side to side forever, while Keys cannot. But she has worked her footwork and spped, so at the AO, she can look play even better. However, there are some difficult matches: against Elise Martens in the third round, perhaps against Elina Svitolina or Dominika Cibulkova in the fourth round, and in the quarters — hello — Osaka, the US Open champion. As Keys said, her defense has improved. Well, it has to get better.